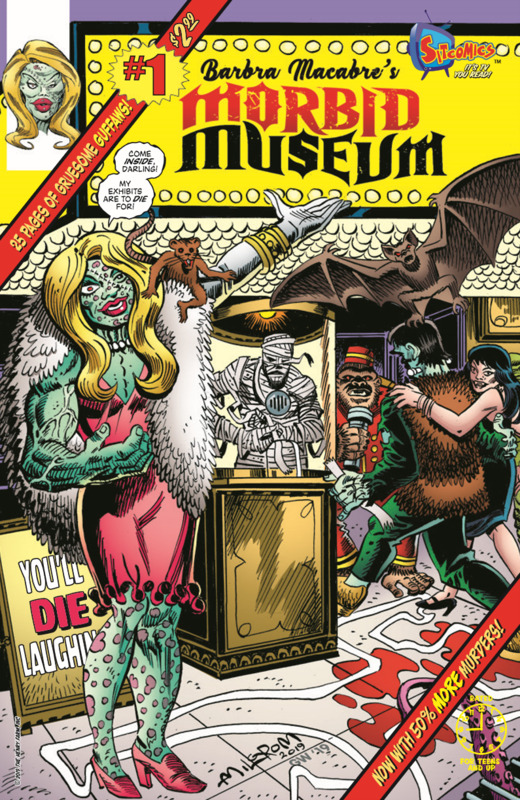 The Fellowship was fortunate enough to obtain a copy of BARBRA MACABRE’S MORBID MUSEUM #1 from Sitcomics. The stories are written by Darin Henry and Dashiell Burton; with art by Al Milgrom and Neil Vokes, colors by Glenn Whitmore, and lettering by Marshall Dillon. “Not Silent but Deadly” – It’s a good/bad day for Mark Cobb. He’s starts his new job as a security guard, but his partner is a bully from his childhood: Chester Long. As the bullying begins anew, Mark finally seeks the revenge he always craved, but will that make things better or worse for him? Darin Henry's scripts invokes the classic EC Comics (TALES FROM THE CRYPT, VAULT OF HORROR) so perfectly, it’s not even funny. Comic vets Milgrom, Vokes, Whitmore, and Dillon did a wonderful job bringing these terrifying tales to life; I can't stop looking at these pages. I love our horror hostess Barbra Macabre; her twisted, humorous rhymes are icing on the cake. A great new addition to the Sitcomics' lineup. Check it out. BARBRA MACABRE’S MORBID MUSEUM #1 is currently available on the Kindle Store, but will be in print and on ComiXology this summer. Also, if your local comic store is not carrying Sitcomics’ Binge Books, not a problem! Ask them to go to Sitcomics.net and they will make it happen!